Numark, the world’s leading manufacturer of DJ technology, announces X7, its new premium club mixer currently under development. Numark will unveil an X7 prototype at the 2010 Winter NAMM Show in Anaheim, CA, booth 6400, January 14–17. X7 is the ultimate companion to the Numark’s new V7 motorized turntable software controller. DJs can link two V7s and X7 using the system’s elegant and powerful communication protocol, which enables system connection to the DJ’s computer with a single USB cable. The cable streams ultra high-resolution audio and control information between X7, V7s and software. 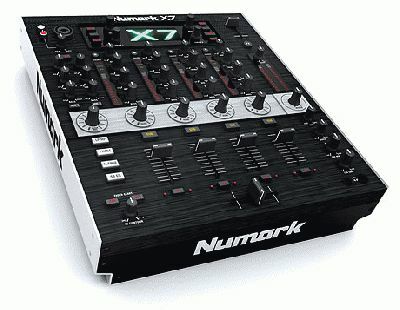 X7 contains two USB interfaces, which enables two DJs to connect their computers simultaneously. This capability enables multiple DJs to perform at the same time, aids in seamless transitions between performers and opens the door to innovative new dual-laptop-performance possibilities. X7 can even sync tempo between the two laptops. X7 is designed specifically for clubs and contains a series of technologies and capabilities that are designed specifically for its intended environment. X7 enables club owners and technicians to lock out or limit the master level and empowers technicians with parametric equalization for optimally tailoring system performance to the specific venue’s acoustics. While X7 is wholly customizable, club installers can easily plug it in and walk away without being required to dig though setup pages. While X7 is designed for the club environment, its features are decidedly performer-centric. Only the finest quality materials and build quality are found in X7. Like NS7 and V7, X7 is housed in a rugged, heavy-duty steel casing. Every switch, button, knob and fader delivers smooth, sturdy, premium performance and feel. X7 contains a complete range of powerful beat-synced effects and filters for unlimited performance. Numark has taken the utmost care in designing X7’s layout to be familiar and intuitive. Even a DJ using X7 for the first time will find it comfortable and self-explanatory. X7 is a four-channel, digital mixer. Its four input channels enable the most advanced of DJ performances and provide sufficient flexibility for future expansions in techniques and style. It contains full MIDI and USB implementation for advanced control and performance capabilities. High end, premium audio circuitry is found in the 24-bit digital mixer. Numark engineers have taken extreme care in minimizing the components in X7’s audio path, resulting in supremely clear, crisp sound quality. X7 will be available from DJ and pro audio retailers in Q2 2010.